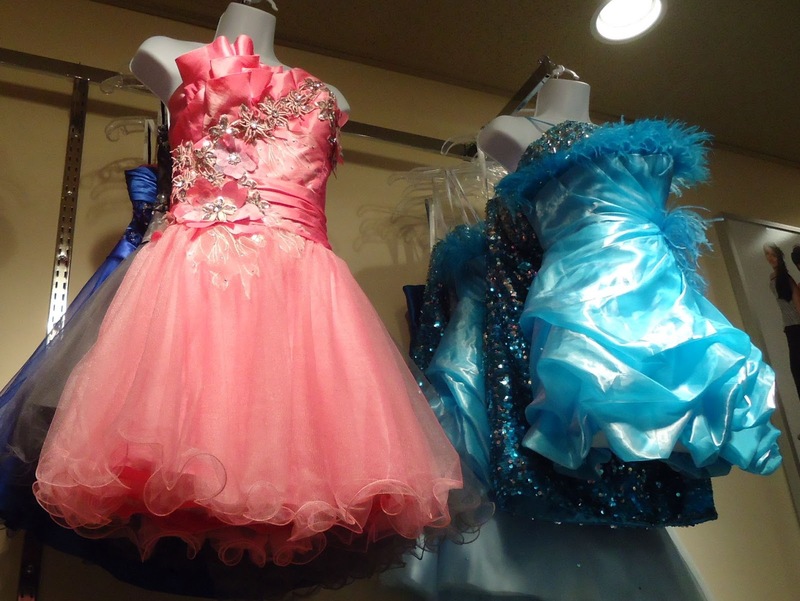 'Tis the season for proms, Grade 12 graduations, weddings (for mothers of the brides and grooms, guests, even bridesmaids), retirement parties and a multitude of other spring and summer "dress-up" occasions. This particular post will center on dressing for the more formal event. It seems that whenever I sit down to write a post, I need to define the main concept before I begin to write. In this case, what is formal? Without taking the time to define fully, I immediately think gowns or "something special" cocktail length dresses; however . . . I have been to events where the invitation read black tie and there were women in "suits" that one would wear to work in an administrative or legal capacity. So is black tie the same as formal? I would say yes. However it is the man who has to be careful in this case; but for a woman, depending where you are, black tie may suggest only long gowns. Every city and region in every country in the world has their interpretation of black tie and formal and what is acceptable or unacceptable. In Canada, generally speaking, I find it just doesn't matter; there will always be those who will pay it no mind. Still the under-dressed patrons are never really inappropriately dressed and so are accepted without question. Never have I seen anyone made feel as if they were out of place. In fact, the ones who were dressed the part, were down-playing their own dress in order to make the under-dressed person feel comfortable. Now I must qualify what I just wrote - I have never been to a black tie event in say, Toronto or some government event in Ottawa, so I may be misinforming you. On the other hand, a Canadian woman who was traveling "on business" related her discomfort with some of the comments made because she did not have the "appropriate long evening gown". Perhaps she was too sensitive. She appeared at the formal event in a cocktail length (just a touch below the knee) LBD, with fashionable jewelry (costume jewelry) to spice it up a notch. I have given that advice: the LBD, the perfect travel wardrobe go-to-dinner, the theatre or corporate event dress. She managed the evening but said that she would know better when told to "bring something for a formal event" the next time she was traveling. Event planners and those sending out the invitations should never assume that everyone knows the "dress protocol" of the hosting city or region. Describing the "dress protocol" is necessary, especially for the out-of-towners. There are many derivations of formal, "black tie, white tie, ultra-formal, creative black tie, formal" - anything else? NICE: As I related in the opening paragraphs, formal is interpreted in different ways in different places. To me, this red gown has just enough bling and I can envision it draping beautifully on the body. NO THANKS 1: These dresses are for the prom. 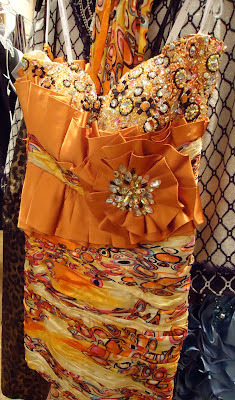 If the last time you wore frou-frou was at your prom or Grade 12 graduation, that probably should be the last time. NOTE-WORTHY Aside: There's something cute and quirky about a shorter cocktail length dress for the teenage "prom". And really this is a once in a lifetime dress. ANOTHER NO THANKS: If these two went shopping together, one appeared to have made a more conservative choice. The less conservative dress (Yikes!) is for later, much later than one's sweet innocent prom year. Oh . . . how naive I am. A woman's dress should be like a barbed-wire fence; serving its purpose without obstructing the view. NO THANKS 3: This one still has too much frou-frou all in one place for me. In my opinion ruffles, bling and floral patterns need to be separated. At the same time I write this (remember the scales - I'm a Libra), I have seen this dress on a 40 something woman and she looked fabulous. Mind, she's probably one of those women who looks fabulous in anything she wears. There are other dresses with beautiful strategically placed single ruffles, with sparkle and bling and that drape lusciously on a body; find one and avoid too much frou-frou. NOTEWORTHY: My formal evening cocktail-length dress is in Canada as I write this so I don't have a photograph but as you see, I have written it in the singular. I only have one such recent dress. I bought it impulsively prior to a fund-raising gala. I had lost weight and was hopelessly determined to buy something elegant with a little bling and I did. I wore it twice, for the gala and then for the upcoming New Year celebration. Those businesses that rent gowns make so much practical sense. The problem is, for most of us in that particular situation, we never think of practicality. 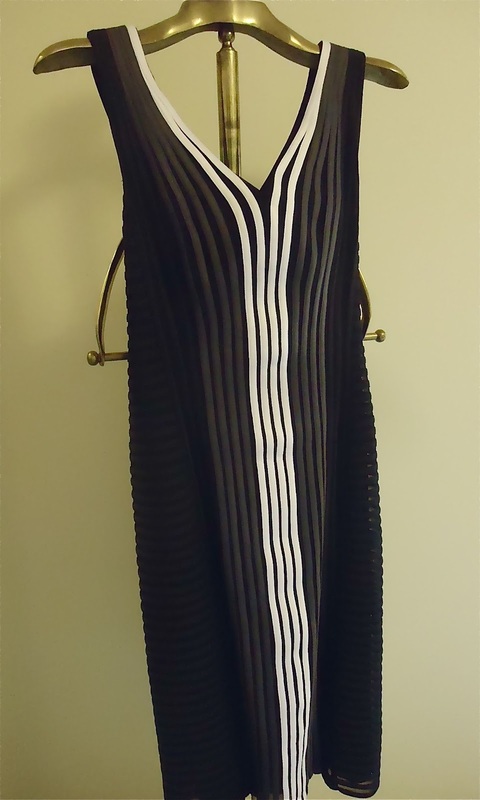 NEW: I purchased this v-neck and back striped cocktail length dress just before I came to France. What? Why would I buy in Canada when I was going to France? It was all in the timing. We were invited out to dinner just two days after arriving and I needed, rather wanted, something new in the category of the LBD. Update: May 31, 2012 - I bought this dress at the end of April, 2012 for full price and I found a photo dated 2009 of this dress on a Google Image search. Sigh. If the link under the photo does not work and you want to see the dress on a professional model just search for Frank Lyman dresses and hit Images - it will take some scrolling down but it's there. Another sigh. Back to the post . . . of course you will decide upon your frou frou tolerance but one more question needs to be addressed. What shoe should one wear? . . . my segueway into the next post. Just a quick note to let you know that I liked what I read. About your Frank Lyman dress - that would really annoy me! That's an AAARRGGHH! not a sigh. Here's where I have to follow my own advice, as given in my June 18th (2012) post, "My travel rule might fit here, if you love it, buy it, don't compare and don't look back." The Way We Dress: What is Chic?